Like all of Paul Reed Smith’s models, the PRS 513 starts with a great design, executed with top grade woods and parts and topped with an impeccable finish. 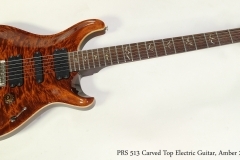 This PRS 513 dates to 2008 and is in very good original condition. The 513 is very similar to both the Standard 22 and Custom 22, but offers a very different pickup configuration. The 513 name indicates the number of pickups, and combinations! There are two separate pickup selectors. The first is a standard 5-way switch, and the other selects the coil configuration – Heavy Humbucker, Clear Humbucker, and Single Coil. Rotary controls are master volume and tone. 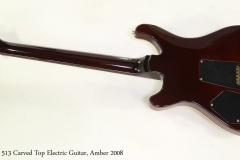 The neck joint has more comfortable sculpting and the PRS-characteristic bird inlays are distinctive. PRS takes a lot of care in choosing highly figured woods and matches them carefully for maximum visual effect. The top is deeply carved and has a translucent amber finish. These really show off the maple’s figure. PRS uses a proven basis for getting tone – a carved maple cap on a mahogany body, and a set mahogany neck with rosewood fingerboard. These combinations provide enough bite on the note attack, and a warm, slow resonant decay profile. The original non-branded PRS case is included. Also included is a hand-made, bear leather strap!